We proudly offer a 10% military discount for both active and retired military families. This is our way of saying THANK YOU for your service to our country!!! Use code military10 at checkout. We also proudly offer a 10% teacher discount. Use code teacher10 at checkout. You have put in the hard work days now it is time for a vacation! Look no further, for the perfect vacation spot is right here on Pleasure Island, located in North Carolina. The sun is always shining, the ocean water is clear and crisp, and there are plenty of activities for the whole family. Not sure which beach activities to do? That is where Pleasure Island Rentals comes to the rescue to provide you with all your beach going needs. With our services we will help make your vacation the relaxing, stress free, dream vacation you and your family deserve. 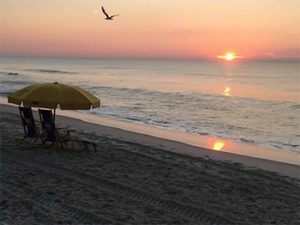 Pleasure Island Rentals has been serving the towns of Carolina Beach and Kure Beach since 1996. Pleasure Island Rentals has become a staple for a source of fun, integrity, and respect here on Pleasure Island. Not only do we supply hassle free rentals for all vacationers we also participate in many philanthropy activities. During our off season Pleasure Island Rentals’ staff members help clean trash off our local islands, run a Christmas tree farm at our shop, with proceeds going to Carolina Beach elementary, work with local boy and girl scout troops to help them earn merit badges, provide services for local charities such as Step Up For Soldiers, Salty Paws foundation, etc.… and many more activities that help create a strong unity community. We have the largest and most extensive inventory of beach gear and accessories for all kinds of personalities. We offer kayak, surfboard, bicycle, and standup paddleboard rentals for all the water enthusiasts. If you want to sit, relax and watch the surf, we can set up umbrellas and chairs for you at any spot of your choosing, on the beach. Whatever you may be looking for to enhance your vacation, we can help you find it. Want to do something with the whole family while exploring the island? Why not take a kayak or standup paddleboard tour with one of our guides? Our staff has an extensive knowledge of the area and its history, as well as having complete knowledge over safety procedures and enthusiasm for kayaking and paddle boarding. With our various tours you and your family will not only have fun and a relaxing time but will also learn and see so much of our beautiful slice of heaven. You have put in the long hours of work, have gotten stressed and now need to unwind with family and friends. Pleasure Island is the destination spot that you need. With our help here at Pleasure Island Rentals we will give you service that is unbeatable and memories that will last a lifetime. 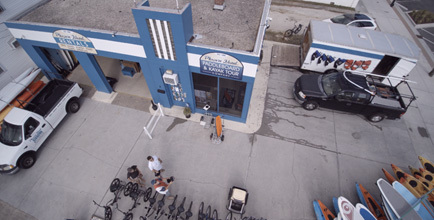 We offer a delivery service on and off the beach for our entire product lineup. Reserve items through the website, email or call us and we’ll get it there.